Kite crafts are one small aspect of crafting. To save you the effort, I have waded through all the relevant craft terms and related them to kite-making. 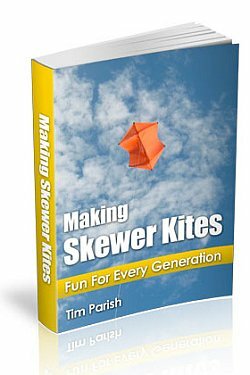 Also, on this page there is an emphasis on kite making for children. This is supposed to be a resource for ideas when it comes to materials and techniques for decorating kite sails. It's pretty complete, I think you'll find! Plastic kites. Our MBK Skewer kites fall into this category. A sail is cut from a colored plain plastic bag, before bamboo skewer spars are taped on. Hard-wood dowels can also be used, to make much bigger kites. We use garden tidy bags for sail material since they are light, large and cheap. These kites fly very well in light winds, and can fly hundreds of feet above the ground if made properly. See that orange Rokkaku kite on the e-book cover. Mini kites. Made from any old reasonable quality paper, such as writing or pad paper. Photo-copy paper too. This type of kite tends to be not much bigger than your hand, and often rely upon a single horizontal spar such as a bamboo skewer or drinking straw. They fly ok in moderate breezes, or when towed enthusiastically! I'll refer to these types of kites, in the following sections on various kite crafts techniques. What about nylon and other types of cloth sails? I'm going to ignore them since that usually involves sewing and a range of kite-making accessories that are beyond the scope of kite crafts for kids. This category is a biggie, with many options for creating art work on sails. Hence I'll split it up into a few sub-categories. Pick which seems to apply best for your situation. There's no hard and fast rule for whether to draw first then make the kite, or the other way round. It depends on the kite and the decoration idea really. One approach or the other will just seem to make more sense, after a bit of thought. There are a million ways to make marks on paper for mini-kites, but some require a fixative to prevent smudging. Spraying stuff onto a kite sail just adds weight, so I'm tossing all those methods out! When it comes to kite crafts, the lighter the better, believe me. Colored pencils of any kind can be used on plain paper mini-kites to turn a child's drawing into a flight of fancy :-) Not much weight added there. Crayons can be used for coloring or drawing. However, coloring could put too much of the composition wax onto the paper, thus making it heavy. Stick with a few bold strokes to add zest to that mini-kite! Pastels, are chalk-like crayons made from ground pigment and a binding material. Pastels produce more brilliant colors than crayons, and yet don't have the drying time of paint. Hardness varies. The softer the pastel the brighter the color, but the softest pastels are prone to smearing. Again, avoid coloring in large areas of paper, since this will add weight. Ballpoint pens with colored ink can be handy for adding line-drawings to paper kites. Tracing paper is pretty handy for convincing onlookers that you are an incredible artist. Just take a sheet of this see-through paper and trace some impressive outlines from a picture or book illustrations, using pens or pencils. Then use the paper itself in a kite! A marker or 'marking pen' often has a felt tip, which is ideal for drawing on plastic. Hence you might also look for 'felt-tipped pens'. These don't have a huge capacity so avoid coloring in large areas. However, some quite wide-tipped pens are out there, which are good for thick bold line art. Most markers are Black, but this can still be effective for doing a face or a large pair of cartoon eyes or something! Transfer paper is something I've never tried with kite crafts, to be honest, but it might be worth a shot on a plastic sail. This kind of paper is coated on one side with gray, black, white, blue, or red material that lets you transfer a design to a surface. The idea is to place a sheet of this stuff, color-side down, onto the surface. The desired design is placed on top of the transfer paper, and a stylus or pen is used to trace the design so it transfers onto the surface. Newsprint, despite its low quality, can be used for making sizable kites. That is, if you aren't too concerned about an exceptionally long life for the kite! At least it looks interesting, if you source it from the local newspaper. There's probably no point in decorating it much, since the print itself is the decoration. However, some nice thick black lines highlighting the boundaries of the sail could enhance the look. Quadrille paper, much loved by mathematics teachers, is sometimes known as graph paper. This paper is printed with fine lines making up a grid. It is great for not only making patterns and design layouts, but also for drawing colorful, geometric shapes. Naturally, these eye-catching works of art can be used in kite crafts! Collage is the art of arranging cut-out shapes or pictures onto a flat surface, where they are glued in place. The resulting art-work is also called a 'collage'. The appropriate light-weight technique is to use minimal glue, and even then, just around the edges of the shapes or pictures. Even the number of shapes or pictures should be kept down, to avoid excessive weight on the kite. The mini-kites are a little small for this kite crafts technique, so consider this for plastic kites and tissue kites. Scissors will be needed of course. They are available in a wide variety of shapes, sizes, and styles. Most of the smaller models would be suitable for kite collage. However, dull-edged, rounded-tip scissors are particularly suitable for young children for safety reasons. Cellophane is a little heavier than thin plastic sheet. However, it comes in richer colors, so use it sparingly for some extra dazzle factor! Tissue paper comes in many colors, luckily for us kite-makers! Sometimes it is named 'wrapping tissue' on the shelves. This stuff is particularly suitable for collage on kites. Magazine pictures could be cut out and stuck on too. Avoid using too many glossy magazine pics or graphics, due to the weight of the high-quality paper. School glue is a quick-drying, versatile adhesive. Since it is non-toxic, easy-to-clean, and cheap it is a great kite crafts choice for even the youngest kids. It's also known as white glue. A stencil is a template made by cutting a design into a piece of stiff paper, plastic or cardboard. Traditionally, this method of decoration involves brushing ink or paint through the cut out areas of the template so that the pattern will be reproduced on the surface placed below. However, for kite decoration, we have to put our thinking caps on to keep the weight down! The key is to apply color sparingly. Just enough to show up the stenciled shape or shapes. Colored pencils, crayons or pastels could be used. Not many people would have the gear on hand, but this would be an ideal chance to get out an air-brush! Same deal though, don't put too much paint on. Now, back to creating the stencils themselves... Utility knives come in different shapes and sizes but one thing they have in common is a sharp, razor-blade edge. Obviously, when using this tool for kite crafts, it's only for adults to use. The utility knife is also known as a craft knife, x-acto knife or razor knife. Kids love rubber stamping. My Aren certainly does, and at this writing he has just turned 3 1/2 years old. In this craft, ink made of dye or pigment is applied to an image or pattern that has been carved, molded, or vulcanized onto a sheet of rubber. The rubber is usually mounted onto something more manageable such as a block of wood or acrylic. The ink coated rubber stamp can then be pressed onto just about any type of surface to transfer the design to the surface. For kite crafts this means paper, tissue or plastic. Since most stamps are quite small, this is probably best for just the mini-kites. However, if the design was simple and bold enough, and was applied enough times, I can see it working on larger kites!